(Phys.org)—Horseshoe crabs, including the iconic Limulus we know today, have existed for more than 450 million years. Over that long history, evolutionary change has particularly affected the nature of their legs. 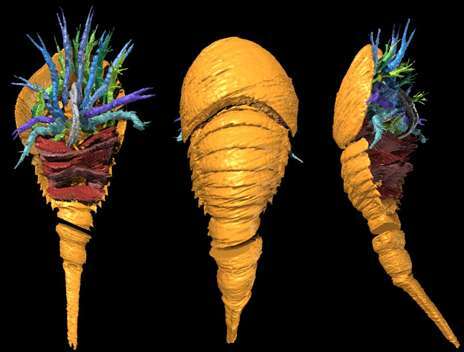 A new fossil discovery in Britain captures a previously unseen stage in the evolution of these ancient arthropods—the transformation of two-branched legs into nearly identical but separately attached limbs, one of which was destined to disappear. "This fossil provides remarkable confirmation of the loss of a limb branch during horseshoe crab evolution, a change predicted by the common presence of two branches in the arthropods that appeared earlier, during the Cambrian explosion," said Derek E. G. Briggs, director of the Yale Peabody Museum of Natural History and lead author of a paper to be published online the week of Sept. 10 in the journal PNAS. Modern horseshoe crabs (Limulus) have segmented legs at the front, which they use for walking and feeding. Their rear legs form flattened gills for breathing. In their ancestors, scientists believe, these functions were combined in limbs with two branches—one limb for walking and eating, one for breathing. Combined with genetic analysis, the new fossil evidence suggests that repression or loss of gene expression might have yielded the modern horseshoe crab's appendage structure. "This discovery should prompt further investigation of the genes that control limb development in living horseshoe crabs, as the process is not fully understood," said Briggs.